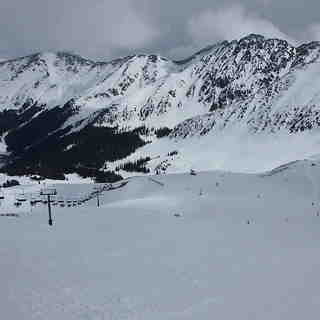 Is it snowing in Arapahoe Basin ?¡Gracias! A moderate fall of snow, heaviest el domingo por la tarde. Freeze-thaw conditions (max 2°C el sábado por la mañana, min -8°C el jueves por la noche). Wind will be generally light. A heavy fall of snow, heaviest durante la noche de domingo. Temperatures will be below freezing (max 0°C el miércoles por la tarde, min -8°C el domingo por la noche). Wind will be generally light. La tabla anterior muestra el pronóstico de tiempo para Arapahoe Basin en la altitud específica de 3977 m. Nuestros modelos meteorológicos sofisticados permiten prever pronósticos para la cumbre, la mitad y la base de Arapahoe Basin. Para aceder a los pronósticos de tiempo a otras alturas, pinche en la navegación en la parte superior de la tabla. Para una visión general, consulte el Mapa meteorológico de United States. A-Basin is a great resort that gets the best late season snow in Colorado, due to its high altitude 10,800 to 13,050. There are some good groomed runs, but most of the resort is steeps with bumps, bowls, trees, chutes and powdery hike to steeps. You can also traverse to fresh snow if you know where to go and are on your game. Skiing at A-Basin will make you a better skier if you are willing to put in the effort. The ski school, for all ages and skills, is excellent. Breakfast and lunch are great and very reasonably priced. Get there early on a powder day (lifts turn at 0830) because the parking lot will fill up. The best terrain is accessed via a hike called the North Pole. Try to have a way to carry your skis on your back and use your poles to help you climb. Completing this hike of about 500 ft of vert will reward you with deep powder, on challenging runs, that has been made safe by ski patrol. For me, the soul of skiing in Colorado is A-Basin. My two best powder days of the year were in April and May at A-Basin.